First off, this is not intended as a true hotel review. 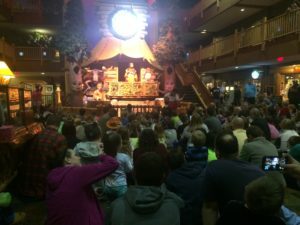 While Great Wolf Lodges are hotels, this article is about introducing you to the adventure opportunities at the resort. Great Wolf Lodge has 13 locations throughout the United States and Canada. The concept is pretty straightforward: a large resort and conference center; with food, bars, and entertainment options; detailed theming; and indoor and outdoor water park features designed to delivery year-round family fun. They have resorts located close to several races that the Casual Runner Team ran and reviewed for you, including the runDisney Disneyland Half Marathon and the Run & Ride Kings Island Half Marathon & Cedar Point Half Marathon. We chose to visit the location in Mason, Ohio, which happens to be located immediately adjacent to the Kings Island parking lot – it is so close you can see the roller coasters from the indoor water slides! We took Ryan, the official nephew of Casual Runner for some fun in the middle of a miserably cold Ohio winter. 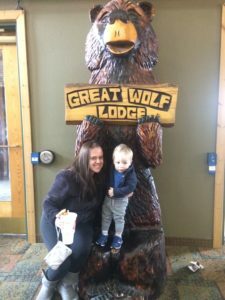 We have friends who absolutely love taking their kids to Great Wolf Lodges for short getaways, so we decided to give it a shot and share our experiences with you. 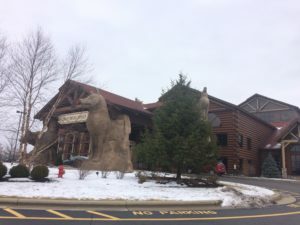 The first thing you have to understand about Great Wolf Lodge is that you have to plan your budget in advance, as it is all about the add-ons and up charges. Lets start with the hotel room. You can book at a variety of price levels based on the type of room, its location (i.e. proximity to the water park and food/entertainment options), and whether it is a themed or a standard room. Then there are two different price levels: one that includes water park tickets for all guests and one that does not. If your focus is the water park, while you can buy day passes, I would suggest getting the room price that includes passes. When we priced rooms, it was cheaper to buy the ticket-included room package as it includes admission on all days on either side of your room nights (we booked a room for Monday night, and so we got water park access for Monday and Tuesday). However, if you are not going to spend every day of your stay in the water park, you can get creative with your packages, even splitting your stay at other nearby hotels, and save yourself a lot of money. One quick note. These hotels are all about family experiences, and they do seem to know what they are doing. For instance, they have posted quiet hours in the hotel hallways to allow families to sleep. They even go around and close corridor doors at designated hours to help out with this. Thus, while we cannot guarantee you uninterrupted sleep, they do a good job of helping you out so that, once your kids are asleep, they stay asleep. The big draws of these resorts are the water parks. Yes, I mean plural. The locations can offer both an indoor and an outdoor assortment of pools, slides, lazy rivers, raft adventures, wave pools, and splash pads. The indoor parks are what makes these resorts year-round destinations. The slides are the big draws and are on par with what you would expect to find at a decent water park. If you or your kids are into water parks, you will not be disappointed. More on the water park itself down below. One quick note, however. If you choose to stay at these resorts and do not get admission to the water park, be sure to check with your specific location as you may not have access to a pool – any pool – without water park admission. They do offer towels and life jackets for kids (in a variety of sizes) inside the water parks. You can also bring your own life jacket for your kids if they will find it more comfortable. We are boaters and have life jackets for all of our little ones that we know they like, so we tend to bring our own. The main lobby is the hub of activity for the resort. It is home to the check-in desk, the entry to the indoor water park, the restaurants and bars, and daily entertainment such as costumed character meet and greets, arts and crafts, and a nighttime story telling show with animatronics. Now, the quality of these characters and shows are closer to being on a par with Chuck E Cheese than they are Disney, but the kids in attendance we nonetheless entertained and excited. The adults were amused by the combination of the joy of their children and the adult beverages being sold a few steps away. That being said, I wouldn’t go out of my way to plan a family vacation around these entertainment options, they are just a nice bonus. Next, you will find several of add-ons, including interactive RFID games for kids. These will certainly keep your kids and young teens occupied as they race around the hotel with magic wands triggering RFID touch points to complete specific quests. These are not included in your room cost, you can add them on, but they do get pricey. Check with your specific resort location, but at the Mason, Ohio location in 2016 they offered upgrade packages ranging from $45-$90 per person. That is more than a day pass to the amusement parks located nearby to several Great Wolf Locations, so plan your budget choices accordingly. Other paid activities vary by location, but include indoor miniature golf and arcades. As you would expect, they also have spas for both adults and children. We found the on-property food options to be over-priced for the area and of mixed quality. As it is quick and easy to pop out of the hotel to a local restaurant or even grocery store, food is a great way to save some money in your vacation budget. We also saw several families have pizza delivered to the lobby rather than pay the higher prices for pizza at the resort snack stand. The best value, however, was the refillable mug. We were able to buy one mug and refill it with soda throughout our stay, and we definitely got our money’s worth on that one. 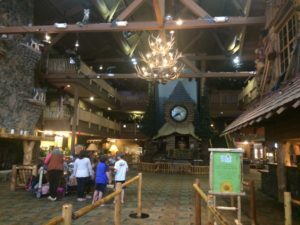 Overall, we had an enjoyable experience at the Great Wolf Lodge in Mason, Ohio. We are not necessarily the biggest water park people, but most kids will certainly be enthralled by the water parks, especially in the middle of winter. In this regard, it makes for a great winter escape, especially when you can save on airfare to travel some place warmer. The resort is nice, well-themed, and well-kept. However, the price points are definitely high for the markets in which they are located. So, this is more of a “splurge” getaway option for most people. While there are ways to trim your budget on a Great Wolf trip, a little bit of homework in advance of your trip can go a long way to saving you money. Keep an eye out for packages, discounts, and especially off-property food and entertainment options. Additionally, if you plan on adding other off-site activities to your vacation (movies, museums, amusement parks, whatever), consider doing a split stay with a cheaper hotel option, and saving your Great Wolf resort nights for the days where you plan on focusing your time and attention on the on-resort entertainment options. When I go to Disneyland, Kings Island, and Cedar Point, I plan on being there at park open and staying until park closing – so there would be no reason for me to pay for a room that includes water park tickets on those days. 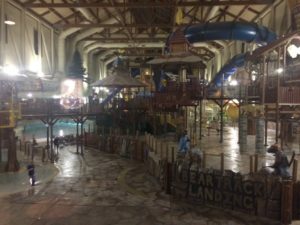 A few thoughts on the indoor water park. Like I said, we had a good time, especially as there were freezing temperatures outside and we were comfortable inside. The indoor space is quite large and they pack a lot of slide and water feature options into this space. However, by definition, it is not a limitless space. Thus, while younger children will have no problem entertaining themselves endlessly on these water attractions, older teens and adults may get bored after several hours. This means that these are not the kind of destinations where you can plan on spending days on end at the water parks. We spent probably 6 hours the first day in the water park, and maybe 4 hours the next day, and we were pretty much done and ready to go. Yes, we felt as though we got our money’s worth, but we also did not feel the need to stay longer and keep riding the slides. Additionally, if waiting in line is not your thing, choose your visit time VERY carefully. No matter where you go, water slides and water raft rides are notorious in the amusement park industry for being low capacity with slow load times. This translates into long lines no matter what water park you visit. If waiting in line is not your idea of an enjoyable vacation, avoid school vacations and long holiday weekends in the winter as these are sure to have the biggest hotel occupancy rates and day guests. By contrast, Great Wold offers mid-week packages at its lowest prices and you will find the shortest lines at those times. and determination will take you!